Hello! Today starts the beginning of one of the most exciting times of the year at Stampin’ Up!, Sale-a-Bration! Yes, I love Sale-a-Bration! Where else can you get something free just for spending $50? Especially, when you were going to spend the $50 any way? The Spring Occasions catalog is to die for, so many beautiful stamp sets and accessories for birthdays, Easter, Mothers Day and Fathers Day, and of course, just because. I love new catalogs! It means, fresh, new ideas and brand new products to spark creativity. Today’s card is just an example of what you will find in the new catalog. 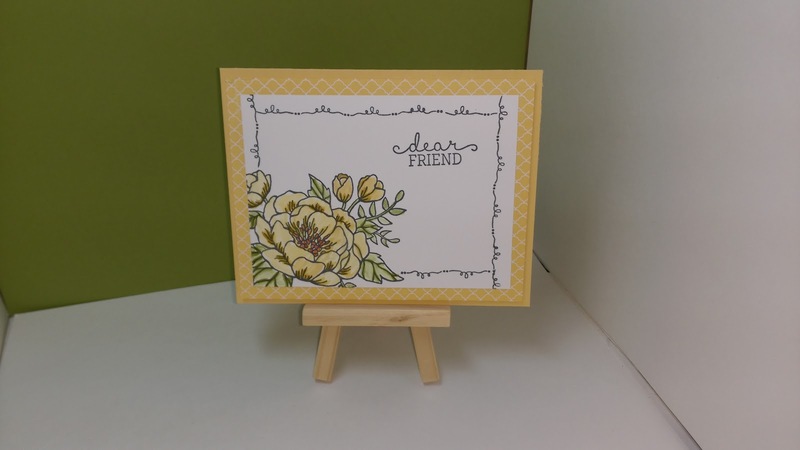 This uses the brand new stamp set, Birthday Blooms. It’s so pretty and so feminine. I just love it. To create this card, I cut a card base from So Saffron CS, 8 ½” x 5 ½” and scored it at 4 ¼” and added a piece of So Saffron DSP from the Subtles DSP pack, cut at 5 ¼”x 4” with Fast Fuse. I then cut a piece of Whisper White CS 4 ¾” x 3 ½” and stamped the large floral image from the stamp set into the bottom left corner using Momento Tuxedo Black ink. I framed the image using the same ink and the loopy border stamp from the “Tin of Cards” stamp set found in the Annual Catalog. 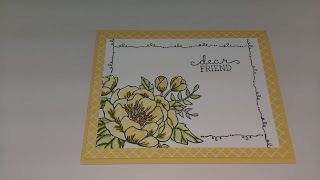 I proceeded to color the flowers, using the blending pen and So Saffron ink and outlined them in Hello Honey ink. I colored the leaves using the Pear Pizzazz ink and outlined them in Old Olive ink, also with the blender pens. I added a sentiment from the same Birthday Blooms stamp set and added the panel to the card base, using Stampin’ Dimensionals. A very easy card with a lot of punch, don’t you think? 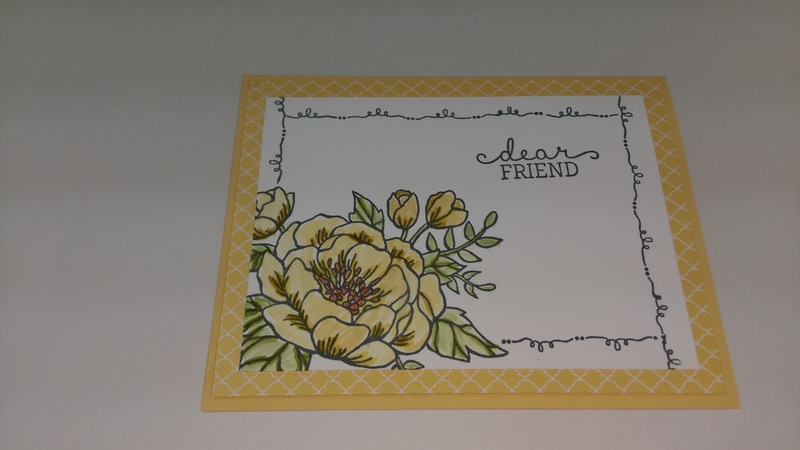 And to add a little something extra special, I added a little clear Wink of Stella to the flower petals and that put this card over the top as a WOW card! You really need to see it in person that’s for sure. The shimmer is just amazing. If there was just one product I could buy from this new catalog, it would be Wink of Stella! That just takes your simple projects and makes it look like an amazing, wow project. If you have never tried it, I would say this is a MUST have for your stamping arsenal. Ok, well I’m off to see what else I can do with the goodies from this new catalog release. Be sure to browse through the catalog and see what wonderful goodies you find that you must have and feel free to leave a comment below to let me know your thoughts about today’s’ card and the new catalog offerings.